The Ameriwood Home Galaxy Audio Stand creates a sleek new space for your home entertainment system. This smartly designed Audio Stand can be added to each side of your TV Stand to provide the perfect spot to place your speakers, gaming system and more. 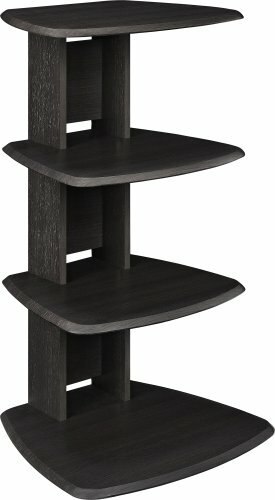 Featuring 4 shelves and a classic espresso finish, this Audio Stand brings a fresh contemporary look to your space. The center spine creates cubbies to store your DVDs and video games and also includes cord management holes to keep your cords tangle free. The Galaxy Audio Stand can also be used as a stylish standalone piece for displaying decorative accents, framed photos and other items. The Galaxy Audio Stand measures to be 35.5"h x 19.69"w x 19.38"d and is constructed of laminated particleboard, PVC and MDF for a strong build. Ameriwood Home Galaxy Audio Stand is recommend to be assembled by 2 adults.